AddFreeStats analytics monitors and tracks the website traffic of your Wordpress.com blog. You will know all about your website visitor behavior! How many people visit your blog? What they read, how they found your blog, where they come from, and much, much more. Easy to use and install, AddFreeStats Analytics is the perfect provider of website statistics for your wordpress.com blog. 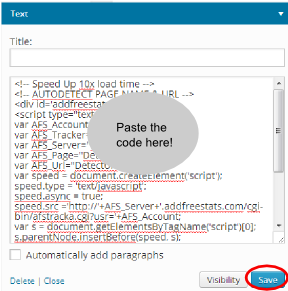 With this 5 minute installation guide, setting up AddFreeStats tracking code for the first time on your wordpress.com blog is simple. 4) After, click on the "change Appearance" link below your blog name. 6) In the section “Available widgets” , search the “Text” widget. You need to scroll the windows to find the option. 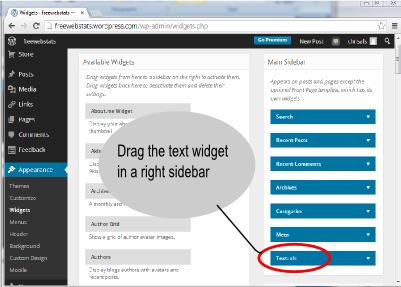 7) Drag the text widget into a right sidebar. 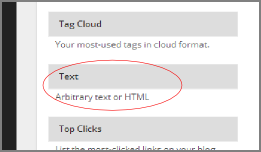 8) Paste the code into the text box and click on the "save" button. AddFreeStats tracking code now is installed on your blog and should start to track your visitors and monitor your blog traffic. To see your website stats, click on the AddFreeStats button displayed on your blog or login into your AddFreeStats account.